The case of the day goes by the name of “blackout at Gardaland” and it gives us the opportunity to speak about a topic which has now become more and more important even in the amusement parks’ sector. Hoaxes are currently everywhere, something that is very evident to anyone who deals with internet and communication on a daily basis. The situation is now so bad that Google has had to get involved with implementing systems to certify news, with the aim of safeguarding correct information and boycotting mediatic garbage that can cause harm to our society. Yet unfortunately this war against hoaxes has only just begun and stopping this rampant, out of control problem won’t be easy. The fact: on Saturday 8th April, an electricity blackout inside Gardaland, lasting only a few seconds, became the mediatic event of the day, warranting itself global coverage on every TV channel, newspaper and news website. Yet was all this alarmism and sensationalism truly justified? How did things go exactly? 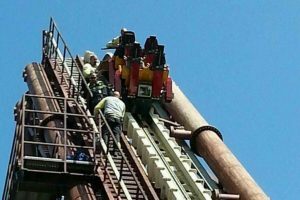 No other attraction - beside Sequoia Adventure – experienced vehicles standing still on the track and with the exception of the 10 aforementioned ones they all stopped working for the length of time that the blackout lasted, namely a mere few seconds. How was this event reported in journalistic terms? Anyone who’s ever got involved in journalism surely knows the “Five Ws”, rules of good conduct identified to help journalists framing facts and presenting them accurately to readers: Who? What? When? Where? Why? Partial or total failure to observe those rules produces incorrect, redundant and unreliable summaries. Regarding what happened at Gardaland, very little of what was written in those news report corresponds to truth, a consequence of not respecting said rules: the news that started circulating were not – in the majority of cases – verified directly by the media but they were instead written after hearing them through the “internet grapevine”, inflated, like in a game of Chinese whispers, with sensationalistic and incorrect terms. 1. Absence of electricity in a park is something that can happen (usually very rarely) and in fact in virtually every rulebook of every park there is a specific entry dedicated to this eventuality. This entry also explains how no refund can be requested in the event of temporary blackouts. If all the journalists that promptly jumped on the news, maybe looking for a handful more “likes” on socials (as we can’t underestimate this aspect, so bad for communication), if only they had carried out a quick little research, crossing data and real first-hand accounts, they would have had to use more appropriate words for such an irrelevant event, delivering more truthful and less alarmistic information. We hope that his case (like many others before) is quickly forgotten; it is however extremely unfortunate that these situations ultimately end up undermining all the commitment and the professionalism that parks, and those working in them display on a daily basis. We must also ask ourselves: if this is the standard procedure, what can we believe in nowadays?